Will you be hiking or camping in bear country this summer? If so you need to learn about proper food storage in bear country right now. Proper food storage in bear country is imperative for the safety of everyone - including the animals. The food we eat is delicious - especially to the wildlife that craves it. 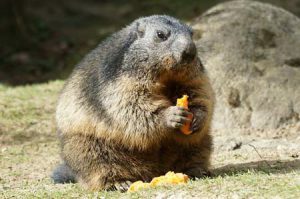 Backcountry food thieves can include marmots, jays, deer, ravens, coyotes, goats, and of course both grizzly bears and black bears. Wildlife will go after any "food" that smells. That includes food, sunscreen, lip balm, water bottles, snacks, pots & pans, and even the clothing that you cook in. Animals can smell these odorous items from long distances because they have a far superior sense of smell than humans. The smells attract creatures of all shapes and sizes and this is bad news. When an animal smells food, it goes after it. It will eat through your tent, break your car window and rip out your seats, destroy your food bags, and ultimately leave you without anything to eat. This is bad. Really bad! Not only because you'll be hungry, but now these wild animals will be trained to go after human foods - a habit that can ultimately cause behaviors that will require that they are killed. 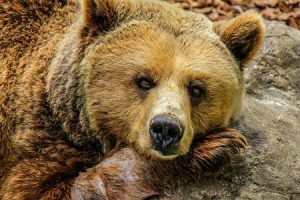 All it takes is one careless person out there and a normal bear that would prefer to avoid humans will become a nuisance bear that is not only a threat to people, but could potentially be killed for its behaviors. All because one person didn't practice proper food storage in bear country. Don't be that person! 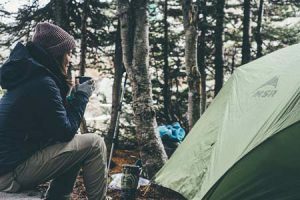 If you're camping at a campsite or plan to camp in bear country, there are some basic "food" rules that you absolutely must follow for everyone's safety. Keep your food secure at all times - day and night. Treat all aromatic items and food items the same. Leave all zippers unzipped slightly at night so animals don't eat through your things. Always cook and store your food at least 100 feet away and downwind from your campsite. Farther is better. Never leave food items in you car. Never be careless with food items. Utilize bear boxes at established campgrounds. Hang your food 10 feet above the ground and 4 feet away from the tree. Store food in bear resistant containers.